I keep track of what trainers write back to me in a spreadsheet. To date over 250 trainers have taken the time to respond. The most popular response I receive is not surprising. It’s why most trainers come to Bootcamp Ideas in the first place, ‘to find fresh workout ideas’. I’ve heard you and have put together this little guide with some different ways to have your groups of mixed fitness levels work together seamlessly. Let’s start with some planning tactics and then I’ll go into how to actually put them into practice. Plan out your workout as you normally would. Once completed create 1 to 3 additional variations of the workout by modifying the exercises. Doing this before the workout, rather than on the fly, makes you look more professional and serious about your clients fitness. So don’t wait until the session to try and make these modifications. Alt. Side Plank Hip Drops: alternate sides each rep without letting hips touch ground in between. How many different fitness level options you create will depend on the actual workout or drill you are doing. Sometimes I will just offer a regular and an advanced option. Other times I will split the group into three or four fitness levels. This method became popular in my workouts after I read Bootcamp Workout Ideas by Garry Robinson. It works similar to offering more fitness variations. Instead of adjusting each exercise though, you simply adjust the number of repetitions for each exercise. I like to set up three levels of Beginner, Intermediate and Advanced. The beauty is that because everyone is working at a rep range designed for them, you can let them work at their own pace and still have the entire group finish within a few minutes of each other. Throw out the stopwatch. No more timed exercises needed with this method. Especially once you get good at estimating your clients fitness levels. This tactic is great for partner workouts where the two campers are working together to complete a goal. Take the fittest person in your bootcamp and pair them with the least fittest. Then take the second fittest and pair them with the second least fittest. Then the third fittest and so on. This way the less fit person will handicap the fitter person causing them to do additional work to make up for or wait for the less fit person. Pair clients into handicapped pairs. Set a cone up 30m away. One partner must run to the cone and back while the other does a strength exercise. When the runner gets back the partners swap roles. Pairs try to complete a total 100 reps of each exercise (in the order they appear). 100 reps is the total for the pair, the exerciser will tell his partner how many reps he is up to when she returns from the run. She will then continue on the reps from that point until one of them reaches rep 100. What you will see happen is the less fit client will run slower causing the fitter client to do a larger share of the reps working them harder. The fast runs if the fitter clients means the less fit client will get to do plenty of slow running as recovery between working on the strength exercise. I love team training. Getting your bootcamp crew into 3 to 5 teams and pitting them against each other is great fun. The only problem is that if one team is fitter they will continually dominate the rest of your group which will reduce the fun factor for everyone else very quickly. This method works just like the Handicapped Pairs described above. Instead of having the fittest with the least fittest though, you want to have a range of fitness levels in each group. Down below I’ll get into exactly how you can actually create these groups. Handicapping will create teams of the same average fitness level meaning you can then have them all attempt the same workout. This method is a team version of Rep Level Variations. This time when you split your campers into smaller groups, you are going to keep the fittest together, the least fittest together and the intermediates together. Now assign each team an appropriate number of reps to do on each exercise. Again this should be worked out when you plan your session. I’ve found that clients love working with others around the same fitness level with them. This allows them to do this while being part of a larger group session of many different fitness levels. Now that one can get everyone in their bootcamp class working at a challenging level, we need work out which client goes in which fitness level group. There are three ways I like to do this. I originally picked this tactic up from my friend Jess Griffin who runs a bootcamp in New Jersey (check out Beyond Burpees). It’s a great way to quickly sort your campers into groups of similar fitness levels. Pick a landmark a few hundred metres away. Have your clients run there and back at their own pace. As they return number them off one at a time depending on how many groups you want. You can also use this method to quickly get the group into handicapped pairs. As the team runs back have them line up in the order they returned from the run in (fastest first, then second fastest, third and so on until the last person comes back). Then have the two people from each end of the line pair up. Then the next two people. Then the next two and so on. The most accurate way to assign a fitness level to one of your clients is with regular fitness testing. You may want to create levels of fitness that have set criteria. For example: You can’t become intermediate level until you can do 20 unbroken full range of motion push ups. The other way is my preference. I prefer my fitness levels to be directly related to the people in my group. The advanced clients in my bootcamp are simply the fittest 5-10 clients in my group. The beginners are the least fit 5-10 and the intermediates are anyone who would find the beginner level to easy but the advanced level too challenging. Fitness testing allows you to regularly assess when someone is ready to bump up a level. It also gives you the big advantage of allowing you to test multiple areas of fitness. The Split the Group Run method above is a quick way to sort clients but it only tests their aerobic fitness. What if I put a great runner in an advanced team for a strength work out? What if that person can’t even do a push up on their toes? They are really going to struggle and they are going to hold that group back. Fitness testing allows you to take all of these options into consideration. This is my favourite way of getting clients comfortable with challenging themselves. Write the sessions workout on a whiteboard along with the corresponding fitness level options and then let them choose for themselves. which option they will do today. You might be concerned that everyone will pick the easy level. Surprisingly though, most clients will choose something challenging for themselves if you give them the choice. And if you feel like a client has picked a level too easy or too hard, you can always tell them to change. Use this method when you need to quickly split your group of bootcampers into two roughly even teams. Have clients pair up quickly with someone they like to train with. Have the pairs line up in two rows facing their partner. The whole group should be in two rows. Then get them to take two giant steps backwards. Have them look to their left and right, they are now standing with their new team. Their partner should be on the other team. Most people like to work with someone of a similar fitness level so when you send one partner to each team you are adding one person of a similar fitness level to each team. Having a group with lots of different fitness levels doesn’t have to be difficult. Just make sure you plan out different options beforehand instead of trying to wing it on the day. A downloadable PDF version of this is being added to the Bootcamp Trainers Toolkit. 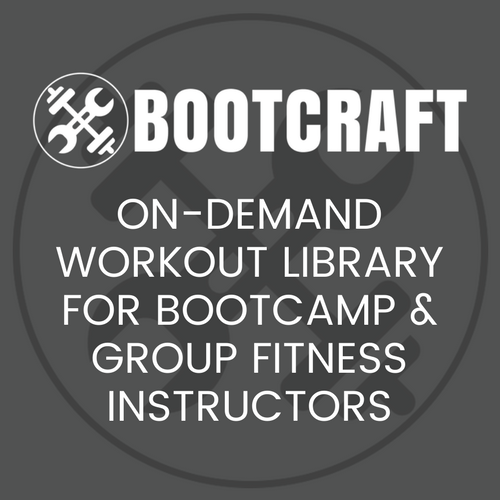 You get access to the Toolkit when you sign up to the Bootcamp Ideas mailing list. It’s free and it involves plenty of new workouts each week. Sign up below to download your copy. Or if you are already on the email list, simply pop your email in again to get access to the download page.